The Grand Strand is known for having some of the best golf courses in the country. While there are over 100 golf courses to choose from, let’s look at some of the option for Myrtle Beach golf on the north end of the Strand. First, we need to define what is considered the Myrtle Beach golf north? To us here at Myrtle Beach Golf Authority, the North Strand consists of the following towns/areas/cities: North Carolina (Brunswick, Calabash, Ocean Isle, Holden Beach, etc. ), Little River, Longs, Loris & North Myrtle Beach. Here are a few of the Myrtle Beach golf north courses that are our favorites. One course that you can count on for great Myrtle Beach golf on the north end is Thistle. The layout of the course was modeled after a Scottish, old fashioned golf course. This Myrtle Beach golf course is always in great condition and has 27 holes (3 9-hole courses) to offer. The amenities are wonderful and the staff is friendly and knowledgeable about the game of golf. 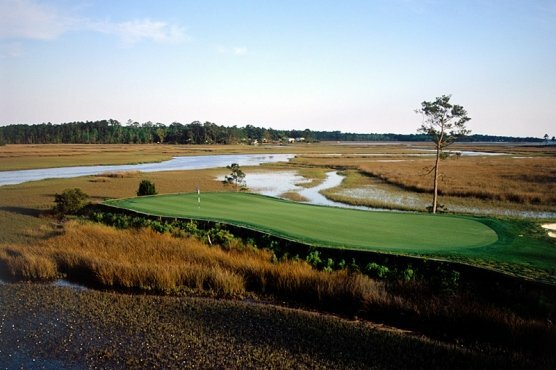 Be sure to add this North Carolina course to your list of Myrtle Beach golf – North end courses to play. Part of four courses that make up the Glen’s Group, Glen Dornoch is the most northern course off Hwy 17 in Little River. Less than a mile up the road from Heather Glen, this Myrtle Beach golf course on the North end is probably one of the most scenic courses that run along the intracoastal waterway. The finishing holes of this north end Myrtle Beach golf course are worth the difficulties that this course offers up to even the most skilled golfers. This course can be paired with other Glen’s Group courses for a very cost effective package for those that are budget minded. This North end Myrtle Beach golf course was designed by Jack Nicklaus and was intended to work with the natural surroundings and is graced with numerous bunkers and hazards that will test the skills of golfers of all levels. This Myrtle Beach golf on the north end is part of the 21 courses that make up the Founders Group. Consider pairing other north end Myrtle Beach golf courses with Long Bay and create a north end Myrtle Beach golf package! Myrtle Beach Golf Authority is proud to a few of the select package providers to be able to book tee times at the semi-private Myrtle Beach golf course on the north end of the Grand Strand. No Myrtle Beach golf package would be complete without a round or two at some of the North End Myrtle Beach golf courses. Call Myrtle Beach Golf Authority today and explore all the North Myrtle Beach golf courses that are offered – many of which are rated tops in the state and even country.